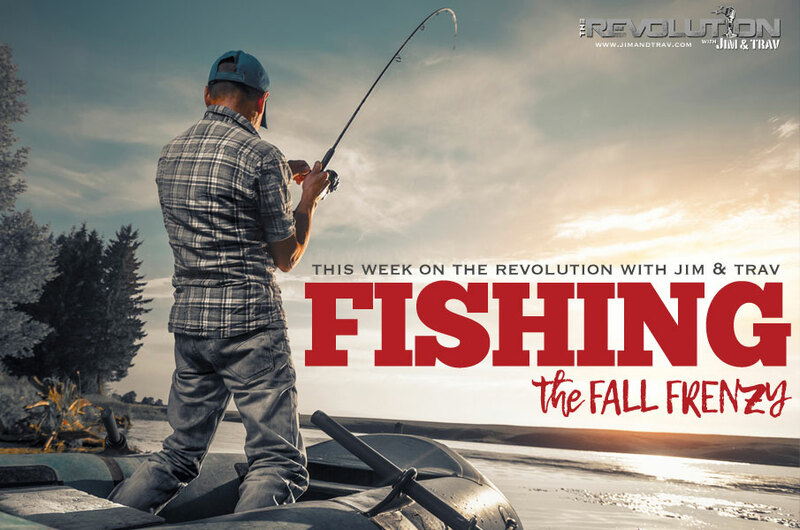 We’re capitalizing on the Fall Fishing Frenzy this week on The Revolution with Jim and Trav presented by Outdoor Channel, Sportsman Channel and World Fishing Network. November is one of the best fishing months for many anglers, but most have winterized their equipment, rekindled their passion for football and forgotten all about fishing, for the time being. They believe that the fall bite is over and done for the season, but they couldn't be more wrong. So our panel of pros, Ronnie Green of A Fishing Story, JP DeRose from Breaking Boundaries, Joe Thomas with STIHL's Reel In the Outdoors and CatDaddy, will dish on what it takes to catch record amounts of bass, walleyes, catfish and more, this time of year. An All American sprinter, officer in the United States Marine Corps, successful businessman - Ronnie Green has done it all. Now you can find him sharing his passion for fishing with the world as the host of A Fishing Story with Ronnie Green on World Fishing Network. Ronnie joins The Revolution to talk fall fishing in Florida with Jim and Trav. Now is the time to target redfish and speckled trout and Ronnie says a big part of your success is in matching the hatch. While you can read endless tips in magazines and online, Ronnie says you really need to pay close attention to the seasonal patterns to see what the fish are already eating this time of year. Once you pinpoint the right food source, it’s all about making it as easy as possible for the fish to get their feed on. Focusing on speckled trout, Ronnie says, “When you talk about grass, a little bit of clear water and shallow inshore fishing, you better get ready. The trout bite is going be on!” Tide and water temperature play a big role in activity, but when on the water he tells anglers to be on the lookout for “nervous water” to identify fish under the surface, and to be ready for the potential to land your limit. Finally, Ronnie says that many anglers give fish to much credit for their intelligence and tend to over think their strategy. He says that fish truly aren’t that complex, they just want to eat and you have to find the right setup to make that happen. Fishing, he believes, is a mental game where your confidence and determination are key. Find out more about Ronnie, A Fishing Story and connect with him online at: www.afishingstory.com. JP explains the effect that lake turnover has on fishing and why it is longer and much more dramatic in Canada. He then turns his attention to bass and walleyes. JP tells Jim and Trav that small mouths and walleyes are actually very similar and if you can recognize some of their behaviors you can better focus your efforts. He says they both like rocky structure, cold water, weeds, they’re adaptable and can live in shallow or deep water and feed when the weather gets rough. For the anglers who are ready to hit the water, he says check the temperature. If the water temps are in the high 40’s and low 50’s, JP encourages anglers to concentrate their efforts between 24 to 36 feet of water. He also says to look to the transitions, the areas where the bottom composition changes, to find where the fish are stacking up. Head out, go slow and use your fish finders. If you can find the baitfish you’ll find the game fish. Once you’ve located the fish, JP says the good news is there are a number of techniques that will produce results, but specifically recommends working them with jigging spoons or vibration blades like a Silver Buddy. Tune in for great advice from this savvy angler. You can also find JP online at www.jpderose.com. Joe Thomas is the host of STIHL’s Reel in the Outdoors on Outdoor Channel. Outdoorsmen and women tend to turn their attention to big game hunting, but forget that fall can offer some prime bass fishing. Joe tells Jim and Trav that he is fresh off of a trip to Saginaw Bay where he had incredible success catching 50 small mouths in one day, without moving the boat. Joe says they found the bite in 3 to 7 feet of water on lipless crankbaits like the Red Eye Shad, jerkbaits like the KVD 300 and tube baits. As the bass group up in the fall it offers a tremendous amount of opportunity for anglers who know how to locate them. Joe says GPS and LakeMaster cards can hold the key to success as they can help you pinpoint ideal underwater structure like the rocky shallow areas and reefs. “If you can find chunk rock with scattered grass, not thick grass, it’s magic. That’s where the fish will be.” Joe notes that the presence of zebra mussels has caused a lot of issues in fisheries across the country, but in this case the one positive outcome is that they’ve improve the water clarity. The improved water clarity means fish can see further so your jerkbaits, spinnerbaits and moving baits are more effective now than when the water was cloudy. As it cools down, Joe says that regardless of what you are targeting, the fish are following the bait. For southern anglers fishing for large mouths on reservoirs and man-made impoundments, Joe says the fish will migrate with the shad into feeder creeks. Tune in to find out where to target your efforts, what to throw and how to make the most out of fall on the water. CatDaddy says, "Dammit man the fishing is good" and that all catfish have fully strapped on the fall feedbag and are aggressively hitting cut shad with a vengeance. CatDaddy explains that the cooler temps have forced the bait fish to shallower bays of the lakes, creeks and reservoirs and that savvy Catmen are reaping the benefits from it. CatDaddy is currently focusing on limb lines, log lines, bank poles and trotlines, and vehemently expresses that you better know your local and state regulations before you ever set out, because a negligent angler could easily find him or herself in a world of hurt, if not.